Pat Curley of the Screw Loose Change blog was nice enough to help promote the "BuildingWhat? "campaign recently by posting their ad. Pat, your strategy of posting their video to help out and then inspiring truthers to donate more by insisting that the campaign is failing is brilliant, simply brilliant, my good man! Your genius efforts have now aided in the raising of over $32,000! This is just like when you claimed that NYC-CAN.org didn't reach the goal of 32,000 signatures for their ballot initiative when they actually gathered 80,000, while you also ridiculed the first weeks numbers of their recent fax campaign. You lit a fire under our butts on that one, helping raise the numbers from 133 in the first week, to 217 the second, 221 the third, and 408 the fourth! All the while, you downplayed our improvement and kept us striving for more! Again, thank you for promoting our efforts to the uninformed, while also misrepresenting the numbers when we surpass our goals by miles, and for making us feel like not reaching overly ambitious goals is somehow a let down. You keep us inspired brother! OK, now let's get serious. Pat states, "LOL! The usual bit about how "nobody knows that another building, which was not hit by a plane, collapsed that day." I have always said that Building 7 is a thin reed to build popular support for the Troof, for the simple reason that it takes too many logical leaps to get to the point where it fits in with the conspiracy theory." I'm not sure if Pat is really saying that it's false that many people don't know about Building 7, or if he is just saying that it's not surprising because in his mind it was a non-event. In either case, David Ray Griffin's essay "Building What? How SCADs Can Be Hidden in Plain Sight" debunks both of these notions. 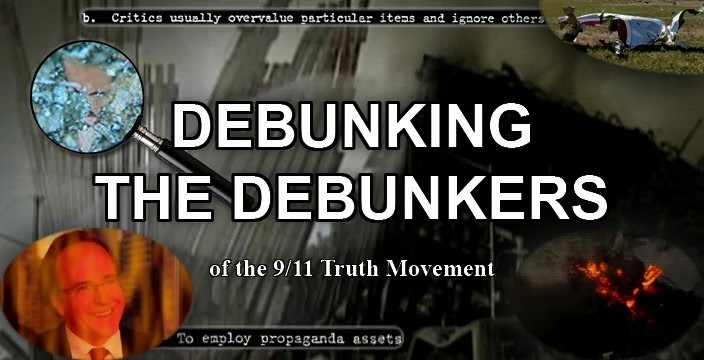 After providing evidence that the collapse of WTC 7 was a "deliberately suppressed story," Griffin states, "...The collapse of WTC 7 has been effectively hidden, even though it has existed in plain sight all these years. Even the bare fact of the collapse itself has been so effectively hidden that in 2006 over 40 percent of the American public did not know about it, and in 2009 a judge in New York City, upon hearing a reference to Building 7, asked: 'Building what?'" I need to respond to an obvious objection: If those who were responsible for bringing down Building 7 were going to need to suppress the video of its collapse, why did they wait until late in the afternoon, when the air was clean and cameras would be trained on this building, with the consequence that we have perfectly clear videos of the collapse of this building from various angles, each one showing its straight-down free-fall descent? Here is an answer to that objection akin to Griffins by Debunking the Debunkers blog contributor AdamT. Pat states, "It is interesting to see more of a side view of the collapse (at about 16-17 seconds in), because it refutes Box Boy's claim that the collapse was symmetrical, and straight down through the path of most resistance." As we've demonstrated before, this video refutes nothing. I think it's time to correct you on a few issues. A couple of weeks ago Mr. Joseph Nobles posted a response to my debunking of his posts on the thermal conductivity of the WTC steel and the corroded steel samples. And on Tuesday, he posted a request to me that I correct myself. I'll be doing some correcting, but not of me. Mr. Nobles claims that Kevin Ryan cherrypicked information in his critique of NIST's WTC 7 report. "If the question here is referring to my "Bush Science Reaches Its Peak" article on the WTC 7 report, and I think it is, then note that I did not say that NIST didn't "include a factor of thermal conductivity" in its model. You only have to read the article to see that the NIST manipulation I referred to had the set the thermal conductivity to zero, which is quite different than omitting it altogether. The fact that NIST set the thermal conductivity to zero in that instance is very clear and supported by the references given in my paper. As an analogy, if someone sets your thermostat to zero, that doesn't mean there is no temperature in your home, correct? Even if they set it to zero Kelvin (absolute zero), temperature would still be a factor (quite a substantial factor for you actually)." So yes Mr. Nobles, NIST did include thermal conductivity as a factor. But because they set the conductivity to zero or near zero, they might as well have not included it at all. Further distortions in the NIST report on thermal conductivity are also noted by Jim Hoffman in his critique of the NIST's report on the Twin Towers. "NIST apparently ignored thermal conduction within its model of the steel structure. Since steel is a good conductor of heat, and the steel in the Twin Towers' structures was well connected, their massive steel structures would have drawn heat away from the parts that were exposed to fire. The Report describes a model of "The Fire-Structure Interface", and describes the computation of heat transfer between the air and the steel structure, but it does not mention the conduction of heat along spans of the steel structure. (p 131-2/181-2) The suspicion that NIST simply ignored the conduction of heat within the steel is corroborated by the Report's disclosure that they used heat transfer tests on isolated steel elements to calibrate their model. (p 134/184)"
As for the corroded steel, Mr. Nobles barely offered any reasonable response at all. That's the problem Mr. Nobles. You claim that it was corroded after the collapse. But as I already pointed out, the people who actually examined the steel stated that it is "possible that the phenomenon started prior to collapse and accelerated the weakening of the steel structure." "Now consider the problem of the molten metal flowing from the 82nd floor of WTC 2. Some have suggested that this metal was the eutectic mixture of Fe and S. Let’s discuss that possibility. We assume that the steel that is cut from the columns is essentially pure Fe. It is melted and mixes with the thermate reaction products and then flows away by gravity. As the mixture cools, if the original molten mix was at S less than 31.4%, Fe begins to crystallize out. This increases the S% in the remaining mix. As the cooling continues, the S% increases until it reaches 31.4%, and this remaining molten eutectic mixture solidifies at 994 C (or 988 C, depending on which measurement you believe). So unless the original S% was 31.4%, the molten mass is crystallizing out solidified Fe as it flows downhill and cools. When, in the cooling process, the molten mass reaches the eutectic composition, it also reaches the eutectic temperature. At that temperature the remaining liquid gives up its latent heat of fusion and crystallizes as a microscopically heterogeneous solid with a (macroscopically) 31.4% S, 68.6% Fe composition. Once all the material has solidified the entire mass resumes cooling. We thus have a plausible explanation of why the material flowing from WTC 2 was orange-hot liquid (~1000 C)." There are clearly many variations of thermite, thermate, and other incendiaries that can be formulated to reach higher and lower temperatures, as pointed out by Dr. Steven Jones. "Of course, there is a straightforward way to achieve 1000°C temperatures (and well above) in the presence of sulfur, and that is to use thermate." At the end of Mr. Nobles' response he offers a very obvious non-response to my other points. First of all, yes, I did have to point out to you that the steel came from Building 7. Your first post on the topic mentioned nothing about Jonathan Barnetts's statement. "They didn't use this particular type of steel in Towers 1 or Towers 2, so that's why we know its pedigree." And in your post written after mine, you then included his quote. You can call the fact that I had to point this information out to you as an "incredible assertion," but it's the truth. Mr. Nobles is apparently unimpressed by Jonathan Cole's experiment, but others aren't, and that includes debunkers. "I'm out of town most of the time of late so I have not been doing much 911 research these days. However, I did have a look at the video. I must say that I'm very impressed with Mr. Cole's experiment - nice job! It certainly looks convincing with regard to how the experiment was carried out and I'm very happy to see someone test something I suggested a few years ago. I am prepared to admit that my initial proposal as to how steel was sulfided during the 911 events needs to be modified. Certainly it looks like diesel fuel, gypsum, concrete and aluminum alone are not going to do it ....."
Dr. Greening has suggested other natural causes of the sulfidation, but he acknowledges that his previous theories have been refuted. This is the point I keep trying to get across to Mr. Nobles. If nothing natural inside the building could have corroded the steel, then obviously something unnatural must have been placed inside the building to cause it. Debunkers have presented several explanations for the corrosion of the steel. Well, the explanations have been put to the test. The experiment has been done. The burden of proof is now on the debunkers to show that something natural could have melted and corroded the steel. Well, I corrected the errors Mr. Nobles, just like you wanted. But of course, it turned out I wasn't the one needing correcting. Side note: Special thanks to John-Michael Talboo and all his contacts for their help. Ignore me all you want Mr. Nobles. It does seem to be the debunker way these days. 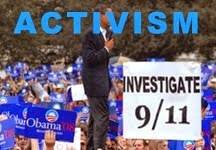 There is no way to stop further 911-type attacks unless we accept the reality of false flag terror. You can arrest or kill every terrorist on earth but when our own side is perpetrating atrocities then there can never be any peace. Disinformation artists (debunkers), mainstream journalists and academics who push propaganda, to keep the public in the dark about staged terrorism, are condemning millions of people to needless deaths. 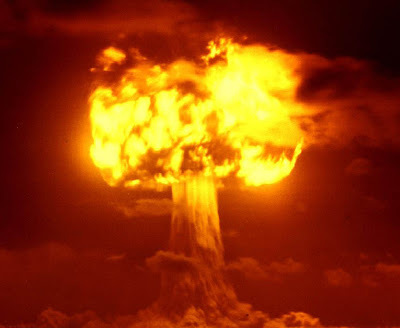 Moreover, those engaged in the cover-up will not be spared in any new biological or nuclear attack. Pawns WILL be sacrificed by the "strategic thinkers" who are running the terrorist agenda. Don't let false flags fly. So the 9/11 debate between Richard Gage, from Architects and Engineers for 9/11 Truth, and Dave Thomas, a physicist from New Mexicans for Science and Reason took place on Coast to Coast AM last night, and I forgot to tune in. A commenter at the JREF forum says they are going to post it, if so I will link it here later. In the meantime, I was scanning the comments there and in the Above Top Secret forum and found some interesting stuff. 9/11 "debunker" Ryan Mackey refuses to do such debates anymore and according to commenter "SezMe" the Coast to Coast debate justifies his position, "This was a confirmation of Mackey's 'ignore 'em' stance. Gage threw so much crap up against the wall that Dave was unable refute all of it. Sadly, I score a win for the truthers." This was a horrible debate. It shouldn't even be called a debate. Almost everything Richard, and Niels was saying went over both of the opponents heads. They couldn't agree because they simply did not have any TRUE understanding of what happened, and actual science. Dave was simply not addressing the points with any true understanding. He is a second rate scientist (if he can even be called one). He lacks all form of reason, and most likely much less intelligent than Richard. He was also annoyingly not familiar with the research material/documents of the opposing party. Now like I said, I didn't hear the debate, but I am confident that this assessment is accurate and is exactly what Mackey is trying to avoid. What I find surreal is your not admitting your two major errors in our debate. It is now proven that the factor of safety for the core columns was 3.00 to 1 for the loads they actually had on them. You insisted it was significantly less than this and tried to say that I was overestimating the energy they would absorb in a collision. Of course, in the Missing Jolt paper we don't even get into the factor of safety and simply use the known yield strength and sizes of the columns to determine their energy dissipation, so it isn't clear why you even made this comment other than to try and create the impression that I was wrong about the column strength. The reality is that you were wrong on this point in every possible way. The tilt in WTC 1 was not anywhere near the 8 degrees that you portrayed it to be when the upper section started descending. In fact, it was provably no more than 1 degree and there is no chance the columns could have missed each other. This has been ascertained using the simple geometry you suggested. When are you going to publicly admit that you erred in these two cases due to your insistence on assuming NIST was correct? Remember you said "NIST doesn't make those kinds of mistakes". Well it turns out they do, and you need to be a man and admit it. Go ahead Ryan, ignore him. 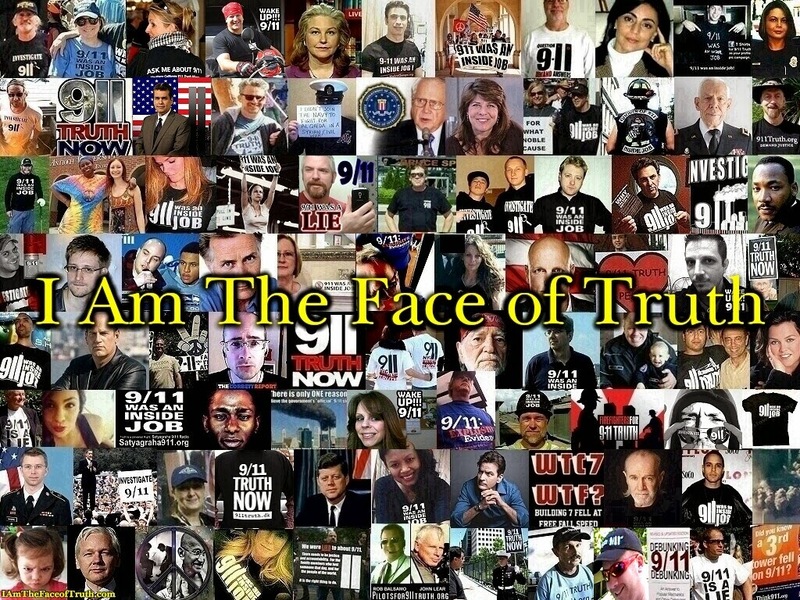 I have been asking 9/11 "debunkers" to put up or shut up for awhile now. I went to your NMSR site per the link provided on this thread and have to say I was surprised to see that you had Dr. Bazant's early hypothesis of a 31 g dynamic load posted there. This has been shown to be impossible by those arguing for the present official hypothesis as well as those arguing against it. First, it isn't possible for an impacting object with a factor of safety of 3.00 to 5.00 to transmit a dynamic load of 31 g's. The upper section would have come apart and that would have been the end of the pile driver. Second, Dr. Bazant is off by a factor of ten on the axial stiffness of the columns in the tower. Their stiffness was 7.1 GN/m not 71 GN/m. Maybe it was a misplaced decimal point, but nonetheless his stiffness estimate is seriously erroneous. Third, your test of loose rice in a bag does not legitimately represent loose rubble as the bag provides a restraint causing the rice to act somewhat in unison, which would not be true of loose rubble developed in a building collision. With the real axial stiffness of 7.1 GN/m the largest dynamic load possible was 11 g's and even then, with the full mass of the upper section participating, the impacting structure could not survive that and thus could not transmit it. This is not to say that a dynamic load was not possible but it would have to be a lower value to conform to the observation of the upper section remaining somewhat intact past the first several floor collisions. However, to have a dynamic load the the impacting object needs to decelerate at a rate greater than 1 g and the amplification depends on how many multiples of g the deceleration value is. There was no deceleration in the descent of the upper section of WTC 1 and the perimeter walls of the upper section were stiff enough to transmit it if there had been any. Thus the lack of deceleration or constant acceleration of the upper section proves there was no dynamic load. Apparently, in an article to be published in the Sept. 2010 issue of the Journal of Engineering Mechanics, Dr. Bazant himself has finally entered the debate on this issue and attempts to argue that the velocity drop would have been imperceptible at the roofline. His opinion is refuted by every single Verinage demolition, where deceleration of the upper section does occur and is very perceptible and measureable at the roofline. 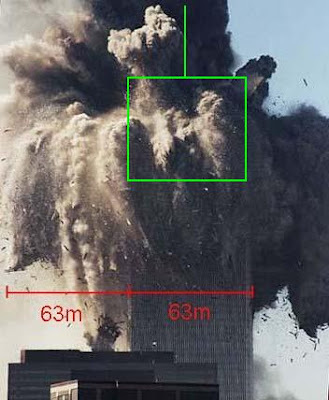 The evidence is that there was no dynamic load in the collapse of WTC 1. Ryan Mackey recognized this in our debate on Hardfire and tried to argue that the upper section fell on the floors due to the tilt causing misalignment of the upper and lower columns. Unfortunately for his argument, it has been shown that the tilt was not nearly significant enough to cause the columns to miss each other, and there should have been a perceptible jolt if the collapse was natural. The only reason there wouldn't be is if the column strength below was being largely removed in an unnatural way. Furthermore, Bazant's work has already been refuted twice in the Journal of Engineering Mechanics. Anders Bjorkman M.Sc. was published in July of this year and Bazant et al. did author a Closure, which Bjorkman called "the most shameful Closure in structural damage analysis history" in his response. Is he right? Well, his response also included a challenge that puts his money where his mouth is! No structure of any kind collapses from top down! It is always from bottom up... So to win the Challenge you have to come up with some other type of structure that really can collapse from top down! I look forward to that. I will happily pay you Euro 10 000:- if you can do that. I cannot find any structure in Universe that meets my Challenge. If his opponents cannot find a way to collect the money offered, then it is indeed possible that they have written "the most shameful Closure in structural damage analysis history." Find this all a bit confusing? As Bjorkman pointed out in his original paper, "simple observations of any video of the WTC1 destruction prove the Bazant... model wrong." Errm... Excuse me SPLC, but I am not "radical right" and I believe in these things. Martial law has already happened - it happens every time the G20 comes to town, the elite brag in their own books and give talks on how they want to reduce population, and the 9/11 conspiracy was forensically proven almost 18 months ago. And no it wasn't "teh jooos", it was an international military intelligence operation. And FYI, citing Popular Mechanics in any context, whether it's 9/11 or FEMA Camps = Epic Fail. The "Popular Mechanics debunked it" claim is so overused and so false that it should be considered its own logical fallacy... I'll call it: The Meigs Fallacy. Obviously whoever wrote this piece of propaganda was to busy fellating satan to do any serious research. Joseph Nobles' newest additions to his site--FEMA Steel and Wick The Heat Away-- attempt to address some of the issues of how the steel in the WTC was affected by heat. As we will see, Mr. Nobles' assertions are, once again, either false or misleading. One of the primary faults of NIST's reports on the WTC is that they did not include the factor of thermal conductivity in their modeling. Mr. Nobles, however, has a different opinion on this. Right. Because they say nothing about steel conducting and transferring heat throughout the building, obviously it's in the report. Amazing that thermal conductivity would be so important, but at the same time NIST offers no detail about it in their report. They would do it for concrete, but not the steel. "Structural steel has a thermal conductivity of 46 W/m/K, which means that any heat applied is easily wicked away. But if that value were set to zero, or near zero, any heat applied would allow the temperature to rise dramatically at the point of application." Here is what NIST's report on WTC 7 had to say about their fire simulations of WTC 7. "The major fires on floors 7 through 9 and 11 through 13 in WTC 7 were simulated using the Fire Dynamics Simulator (FDS), version 4, in a manner similar to the simulations conducted for WTC 1 and WTC 2 (NIST NCSTAR 1-5F)." NIST NCSTAR 1-9, Vol. 1, page 4. And what did NIST say about their fire simulations of the Twin Towers? It is apparent that NIST went out of their way to include no thermal conductivity at all in their modeling. Now let us turn to Mr. Nobles' section on the corroded steel from WTC 7. Mr. Nobles presents what he considers to be conclusive proof that the steel was not attacked by thermate. What Mr. Nobles seems to forget is that 1000°C is far hotter than the temperatures that NIST claims were in WTC 7. NIST states nowhere in their report that any of the steel in WTC 7 had been heated to 1000°C. Their most extreme claim is that the steel had been heated up to 675°C. 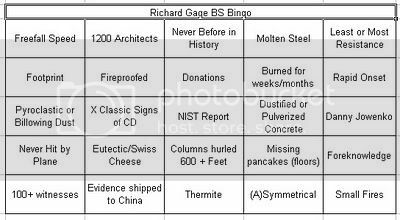 And NIST has no evidence that any steel in the WTC had been heated up to 700-800°C. As to why the steel was only heated to 1000°C, I cannot say for sure. But it's important to remember that, although thermate burns at temperatures much hotter than 1000°C, the steel would not necessarily have been heated to the exact temperature of whatever corroded it. For example, the NIST report on WTC 7 claims that the fires in the building were as hot as 2012°F, but that the steel only reached temperatures as hot as 1250°F (675°C). It is possible that the thermate that melted the piece of steel cooled somewhat as it reacted. But the main point is this: If nothing natural inside the building could have corroded the steel, then something unnatural must have been planted inside the building. This is the subject of the next part of Mr. Nobles' page. Where Did The Sulfur Come From? Unfortunately Mr. Nobles, these sources HAVE been ruled out. In the last two parts of Mr. Nobles' page on the corroded steel, he acknowledges that the piece actually did come from WTC 7 (something that I in fact pointed out to him). But he claims that this piece has no real importance to NIST in their investigation. And contrary to what Mr. Nobles claims, the investigators did suggest it was "possible that the phenomenon started prior to collapse and accelerated the weakening of the steel structure." Mr. Nobles' final statement is quite astounding. Mr. Nobles just recently addressed my latest post about his website. Yet again, he doesn't seem to think I'm addressing all that I should. As we will see, Mr. Nobles has a talent for addressing one point out of a huge argument and acting as if it is the central point to the whole argument. Thus, he holds great promise in the debunking community. He apparently thinks I don't have good reasons to distrust NIST. Well, given the fact that I very clearly demonstrated that NIST falsified the data in their report about the lack of shear studs in WTC 7 (a point which, by the way, was supposed to be a reason that other steel skyscrapers had not collapsed from fire) and that NIST failed to factor in any thermal conductivity in their models, I'd say I have very good reason to distrust NIST. 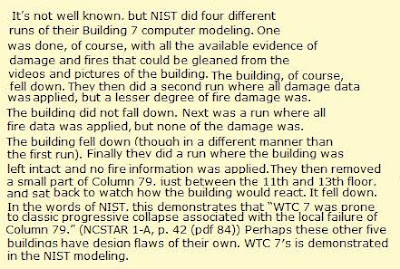 Given the fact that NIST obviously didn't factor in these parameters in their models, I'm not surprised that the NIST models found a "design flaw" in Building 7. I guess it also doesn't bother Mr. Nobles that NIST's report states that column 79 failed and accelerated at an extremely fast rate in 1/5 of a second, a virtual impossibility. Mr. Nobles acts as if I don't address NIST's report as much as I obviously did. But perhaps that is why he didn't even provide a link to my original post. I am well aware of the ARUP study. But, as you made clear in your original post Mr. Nobles, it is not impossible for steel buildings to collapse from fire, whatever their construction. But in any case, we are just talking about one building out of several buildings that all had more severe fires than the Twin Towers and Building 7. Mr. Nobles, you constantly claim I ignore important points. And yet you don't address the points I do bring up in great detail. If you want to just take NIST at their word, then fine. But please try to point out anything that I get wrong, or else this will get quite repetitive. In other words, (as others on this blog have said) put up or shut up. Mr. Nobles’ latest addition to his website is a page attempting to show how other skyscraper fires are not comparable to the Twin Towers and Building 7. He focuses on the skyscraper fires featured in the AE911Truth power point. Because Mr. Nobles uses similar arguments for more than one of the listed buildings, for this post I will list an argument, state which buildings it applies to, followed by my response. A quick note: I will be citing NIST several times in this response to refute many of Mr. Nobles’ arguments. Some may criticize me, saying things like “but if you disagree with NIST, why do you cite them?” I cite them because there are parts of their investigation that do seem to be backed up by empirical data and common sense. And this is supposed to be the official explanation for what happened to those buildings, so if anyone disagrees with NIST, they should complain to NIST and not me. I will also be pointing out several things that NIST does get wrong. But if anyone thinks they’re right, then explain why I’m wrong. Response: This detail can be seen as least significant, as NIST mostly blames the collapse of the Twin Towers on fire and entirely blames the collapse of WTC 7 on fire. Although it can be argued that the plane impacts greatly damaged the buildings, NIST seems to have exaggerated the amount of damage the buildings actually took. And given the fact that the initial tilts of both Towers were not in the direction of where most of the structural damage was, the loads the buildings had to take as they collapsed would not have been a major factor. Response: This argument obviously applies more to Building 7 than the Twin Towers, as the fires were on the upper floors of Towers. While there were fires on the lower floors of WTC 7, the question is if these fires were severe enough to cause collapse in the first place. More on this will be discussed below. Many debunkers have suggested that the partial collapse of WTC 5 supports the theory that fire could have brought down Building 7. In fact, if anything, it does just the opposite. Debunkers also point to the firefighters' testimony. That is addressed here and here. It is often claimed by debunkers that these photos show that Building 7 was almost totally engulfed with fire. 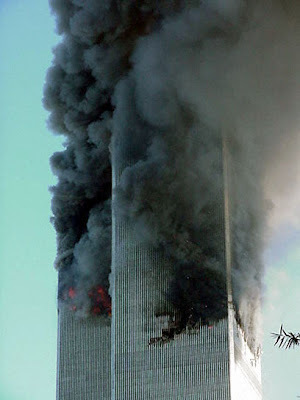 But as others have pointed out, the large amount of smoke on Building 7’s south face was most likely caused by a negative low air pressure, which caused smoke from the burning WTC complex to cling to Building 7. 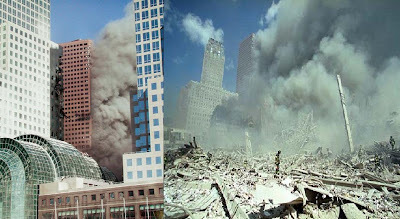 Multiple photographs show that the same thing happened to WTC 1. Although steel has somewhat lower heat conductivity than that of other metals, compared to non-metallic materials its conductivity is extremely high. If a fire does not consume the entire structure, the structure will conduct the heat away from the main source of the fire. This would not have applied to the Mandarin Oriental, as its entire structure was almost totally engulfed by massive flames. NIST did not even include thermal conductivity as a factor in the collapse of WTC 7. It should also be pointed out that the characteristics of the fires in other buildings were quite different than the fires in the WTC. In the other building fires listed, the fires produced extensive window breakage, exhibited large areas of emergent flames, and went on for several hours. The fires in the WTC towers did none of these things. 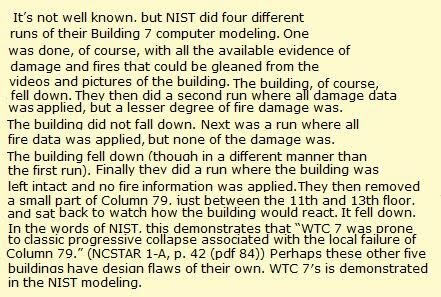 Ultimately, while blaming the fires in WTC 7 on the collapse, NIST claims that the significant difference between Building 7 and other building fires has more to do with the differences in design than the severity of the fires. This is discussed below. •Steel is a good conductor and concrete is a poor conductor of heat. Thus in a fire, a steel frame will conduct heat away from the hotspots into the larger structure. As long as the fire does not consume the larger structure, this heat conductivity will keep the temperatures of the frame well below the fire temperatures. The same is not true of steel-reinforced-concrete structures, since concrete is not a good thermal conductor, and the thermal conductivity of the rebar inside the concrete is limited by its small mass and the embedding matrix of concrete. •Fires can cause spalling of concrete, but not of steel. This is because concrete has a small percentage of latent moisture, which is converted to steam by heat. Thus, a large fire can gradually erode a concrete structure to the point of collapse, whereas a fire can only threaten a steel-framed structure if it elevates steel temperatures to such an extent that it causes failures. So, NIST now admits that one of the three listed buildings also did not have shear studs, but it did not collapse. This greatly decreases the credibility of NIST’s arguments. It appears, therefore, that NIST, having developed a theory that would seem plausible only if the girders were not connected to the floors with shear studs, simply made those studs vanish. 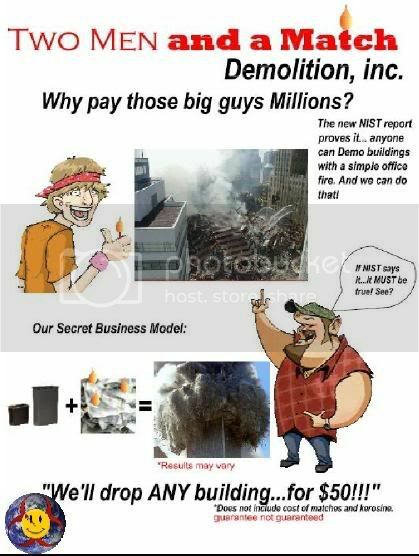 Any significant differences in the design of WTC 7 and other fire engulfed buildings that NIST and Mr. Nobles claim would seem to exist because of NIST’s falsifying of data. Mr. Nobles makes an amazing statement. This statement is quite rich, considering that debunkers have tried to compare the WTC to things like high schools and badly constructed toy factories. 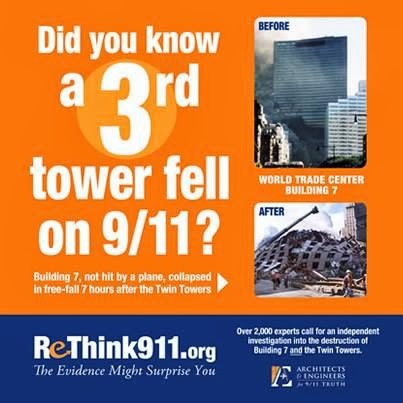 To debunkers, if it’s made of steel and collapses from fire, it’s comparable to the WTC. This is complete nonsense. Even if there were some differences in design, if we can’t compare the WTC skyscraper fires with other skyscraper fires, then what can we compare them to? Mr. Nobles offers three arguments for why the Towers were doomed to fail (my comments in red, some links). The fires were never fought by any means in either building. The task of simply arriving at the floors proved to be too much for first responders to accomplish before the towers had fallen. Perhaps, but given the fact that neither of the Towers burned for even two hours, it is questionable how significant this would have been. The fires were started over several floors simultaneously. Office buildings are designed to resist a slow-moving fire in one location. Fires were started in the WTC Towers simultaneously over several floors and over immense areas of these floors. And the floors, by the way, were the size of city blocks. Pictures show these fires burning entire lengths of the building in places. While this may have been true for the North Tower, the fires in the South Tower appeared to be going out shortly before its collapse. The fires did not even spread to the other side of the South Tower. Strong fires tend to spread. The fires were ignited with jet fuel as an accelerant. A large portion of jet fuel was consumed in the initial fireball on impact, but hundreds of gallons were left to help feed the fires in their first few minutes. In fact, the amount of fuel that remained in the Towers would have fit into a mid size U-Haul truck. The pictures you might have seen of weak or non-existent fires in these buildings were taken in the first few moments, when the fireball had robbed the fires of much oxygen. Again, very few flames were visible in the minutes before the South Tower’s collapse. The heat energy remained, however, and as oxygen returned through the immense holes left by the airplanes, the fires found plenty of jet fuel to reignite and start the massive office fires that resulted. But unfortunately, NIST has no evidence for high temperatures in either building. To show that WTC 7 was also doomed to fail, Mr. Nobles refers to a series of computer simulations NIST did of WTC 7. Of course. When all else fails, use a computer model! 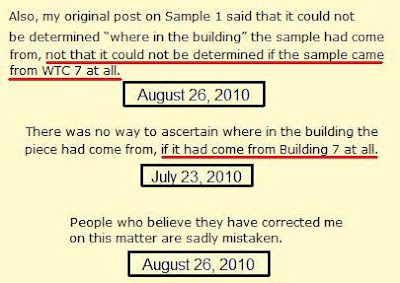 NIST’s assertion that the failure of column 79 would have led to the total collapse of the whole building isn’t backed up by any independent verification. NIST has never released their modeling data, so it’s not open to peer review. As I have already shown, NIST has clearly distorted the data in their report. What’s more, NIST’s data shows that column 79 collapsed and accelerated at an extremely fast rate within only a fifth of a second, even though it was still supported by more than 30 floors of restraints. This would have been virtually impossible. The only evidence we have that column 79 was an “unrecognized design flaw” comes from NIST. Does that sound credible? Mr. Nobles believes there is no comparison between the WTC and other building fires. This is obviously ridiculous. When one looks at things in perspective, it becomes obvious that the Twin Towers and Building 7 should never have collapsed because of the fires in them. There are a lot of sites out there "debunking" 9/11 truthers, global warming "deniers", natural health "quacks", "anti-vaxers" and anyone who questions the dogma of Darwinism. My question is, why? If the mainstream view is so obvious, why bother? I mean you don't see many "Debunking Holocaust Denial" websites or "Debunking Flat Earth" websites or "Debunking Geocentrism" websites. So if the "consensus views" of 9/11, climate change, medicine, evolution etc. are as obvious as a round Earth, a heliocentric solar system or the fact that the Holocaust happened, as you "skeptics" like to claim, why even bother "debunking"? You're obviously threatened by your opponents or else you wouldn't be doing it. What's even more ironic is in all these case you claim there's no debate. "The debate is over" say the man-made global warming proponents - as you're producing lengthy "rebuttals" to lectures by Lord Monckton. Well evidently there is a debate or else you wouldn't be trying so hard to refute him, would you? "9/11 conspiracy theories are as baseless as holocaust denial" say thermite deniers like Michael Shermer - as you regurgitate the same old lies from discredited authorities to "rebut" us time and time again. Put a bent spoon in it, Shermer! So stop comparing your opponents to flat-earthers and Holocaust deniers, stop saying there isn't a debate, stop using straw-man arguments and ad-hominem attacks, stop putting blind religious faith in discredited "scientific" authorities and biased computer simulations, stop making up false claims about the peer-review status of the science supporting the other side, and put up or shut the f*ck up! More Truth Hidden In Hollywood: One-In-Five Phone Calls Are Recorded! This is a two year old clip from Jay Leno I stumbled across today of actor Shia Labeouf revealing that an FBI consultant on a film he starred in told him that one-in-five phone calls are recorded in the US, and proved it by playing back a recording of a phone call he made two years prior! Eerie truths occasionally do come out in the celebrity world, but are buried and tend to be laughed off like it's no big deal. Back in February, an Indian film star revealed on a British chat show that images of his body scan were printed and circulated by staff at Heathrow airport - contradicting claims by authorities that body scan images can not be saved or printed.